Getting to Know the Paul of the Bible As opposed to the Paul you think you know The Apostle Paul is probably the most misunderstood writer in history. Many Christians and Jews believe that Paul was an anti-Law Jew who established a Gentile brand of Christianity that was different from his ancient faith. We learn otherwise when we study Paul’s writings from his own words within the context of his biblical, cultural and Hebraic world. 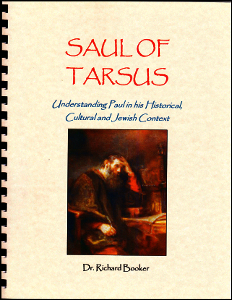 In this incredibly revealing book, Dr. Richard Booker helps us understand Paul, a Jew from Tarsus, a Roman citizen, a Pharisee of Pharisees and student of Gamaliel who encountered his Jewish Messiah and whose writings have changed the world. Dr. Richard Booker is President of Sounds of the Trumpet and the Founder of the Institute for Hebraic-Christian Studies. He is the author of 35 books, numerous college level Bible courses, and approximately 600 television programs. He and his wife, Peggy, have led tours to Israel for 25 years where Dr. Booker was a speaker at the Feast of Tabernacles for 18 years. Dr. Booker is considered a ministry pioneer, spiritual father and prophetic voice. See his web site at www.rbooker.com.